Wireless doorbells by design are more portable than a wired solution. But what if you wanted to make it even more portable? For that, you need a battery operated doorbell. In this post, we take a look at the best portable wireless doorbell options that have battery-powered receivers. Sure, you can plug the chime in wherever you need to (assuming you have a spare power socket) but it’s no good if you want to take it to the garden, or to the garage. For that you need something more portable. Which Portability Options Are There? Are There Any Drawbacks For Total Portability? 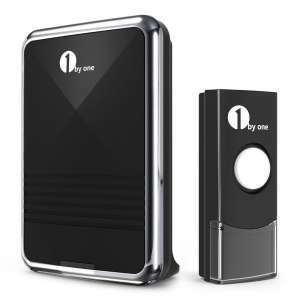 1byone – The Best Portable Wireless Doorbell! I have told you about a friend of mine in a previous post about video integration. He works from home most weekdays. He has gone for option 4. It is probably the option I would go for too! He is alerted through an app on his phone, where he can see the visitor and decide whether to make the journey through his house to open the door! In fact, the option he went for is the Ring Wireless Video Doorbell, which also gives him the option to let his visitor know he is on his way. Not only is it a great option for his shed based office, but it is also awesome for when he is not at home! He can access the app from anywhere with a fast internet connection, and speak to his visitor! Anyway, this post is not about video integration (We have already covered that!). It is about portable wireless doorbells! Basically, it means you do not have to plug the chime into a power socket. Having a battery-powered wireless doorbell opens up the portability options. There is (almost) no limit to where you can put the chime. It can be taken anywhere…..total portability! I say total, but you must remember, it will only pick up a signal from the transmitter if it remains in the working range! You can’t take it to work 20 miles away and expect to be alerted! There is an option for that, a video integrated wireless doorbell! Sure, there is one glaring drawback! Remembering to change the batteries. If you don’t have many visitors, they could last a while, but if you regularly order random things from the internet ( a couple of deliveries every day! ), you need to remember to check them every set period (6 months for instance). The other issue that you need to consider is the working range. If you stray outside of the range then you will begin to see some issues. If that is the only price you pay for total portability, then I am in! That’s easy, you need to be searching for battery powered, or portable wireless doorbells. There are plenty of options out there for you! 1byone are one of the best wireless doorbell producers at the moment, they are selling tons of them on Amazon, and for good reason too! It is so easy to find a 1byone doorbell with excellent reviews. Here we are looking at portable wireless doorbell options, and would you believe they have this covered…. Take a look at the 1byone Easy Chime wireless doorbell. The wireless chime is powered by 2 AA batteries, unlike their other options, it doesn’t need to be plugged into a wall socket. This option will give you total portability. The range is 100 meters, it has 36 CD quality sounds to choose from and the push button is rated IP44. If you are not sure what that means, take a look at the post we published about waterproof wireless doorbell options. If you need extra wireless doorbell receivers, 1byone have you covered here, you can buy additional push buttons and receivers if you need to. 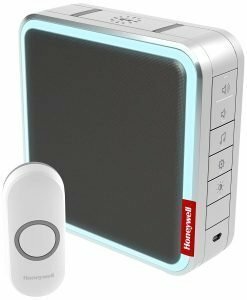 Honeywell produces some of the finest doorbells, and series 9 is no different. What we are looking at here is the portability of this option, and the fact that is has a battery powered doorbell receiver means it is portable. The Series 9 can work up to 450 feet away from the transmitter and comes with a wall mount or can be free standing. The unique selling point of the Series 9 is the fact that you can add your own MP3 to the receiver and use it as the chime when you have a visitor! That is not a common feature of wireless doorbells, but it is very welcome on the Series 9. Another great feature is the brightly lit halo around the edge of the receiver. If you are hearing impaired, then this doorbell is a good option for you. In terms of being expandable, the Series 9 can have up to 6 transmitters attached to it. These can be extra push buttons, door contacts, or motion sensors. Ring offers a totally portable doorbell. In fact, it is so portable that you can speak to your visitors from anywhere in the world! Assuming you have good coverage on your mobile device! No, I am not talking about the films here with that weird kid who creeps up the stairs! I am talking about a well-known brand of video wireless doorbells, that my strange friend who works in his shed uses! These are both great (But expensive!) options, that have apps to be able to communicate with your visitors wherever you are in the world! How is that for portability! Take a look at both options, and if you have Alexa, then the Ring 2 is certified by Amazon to work with her! There are options above that I am sure will fit your needs if you need a portable wireless doorbell! If you need an excellent, and cheap option, then the 1byone is for you. 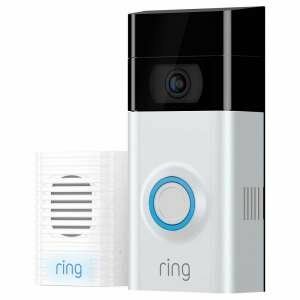 For a bit of extra cash and the added integration options, you can go for one of the Ring wireless doorbells. 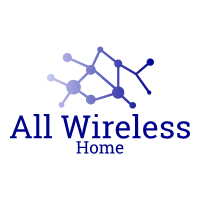 Portable wireless doorbells are fantastic if you have a need to carry the doorbell chime around with you, but always ensure you are within the working range otherwise you will begin to see transmission issues. If you have purchased any of the above then please let us know your opinion, we would love to hear from you!